Introducing Aura MUGLER Eau de Parfum, the new Oriental Botanical fragrance that radiates a wild blend of botanical freshness and feline sensuality. Aura MUGLER is a fragrance of vital energy that reveals the Aura in every woman. 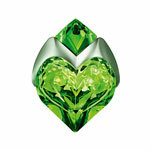 Aura MUGLER is created around three distinctive and addictive hearts. The instinctive heart contains the tiger liana plant which is the guiding thread and signature note of this fragrance and features fresh, green, sweet, animalistic and smoky notes for instinctive femininity. The botanical heart is a duo of green and floral notes with a blend of rhubarb leaves and orange blossom absolute for an explosive and intense freshness. The animal heart is the combination of bourbon vanilla absolute and wolfwood, a new silky enveloping wood with a sensual texture. The bottle represents one of the most universal symbols, the heart and is facetted like a gem. The mysterious emerald colour of the bottle is also the colour of life, luck, hope and intuition and the colour of harmony between body, soul and emotions.